For a very long time it has been possible to command a ship to move to a particular destination by right-clicking into empty space, but there has been no way to command a ship to approach and attack another ship. That has now changed! In their simplest form, attack commands are very simple to use and work almost exactly like move commands. Simply left-click on one of your own ships, and then right-click on an enemy ship to command your own ship to fly to the enemy ship and attack it. The computer will automatically determine the ideal distance from the enemy ship as well as the ideal flank to attack from (that is, whether to fire from the bow, stern, port, or starboard sides of your ship). 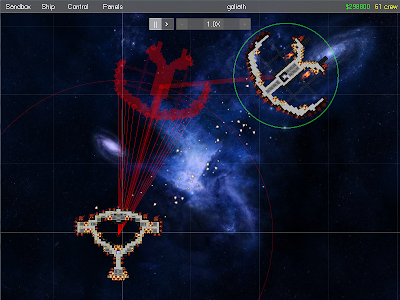 A red circle will display the distance from the enemy ship, and a red ghost of your ship will show you exactly where your ship will station itself relative to the enemy ship. As an advanced "power player" feature, it is also possible to right-click on an enemy ship and then, without releasing the right mouse button, drag away from the enemy ship. Doing so allows you to adjust both the attack distance and the direction to attack from. Thin red lines show which weapons can hit the enemy ship. The screenshot above shows an in-progress right-click-and-drag away from an enemy ship. It is currently not possible to manually adjust which flank your ship will fire from. This feature is hopefully coming soon. This is just a quick update to show off a refinement I made to the sandbox user interface. If you remember from my previous blog post about the sandbox, I lamented the separation between the two separate Build and Play modes -- one mode for modifying ships, the other for playing the game. As simple and as easy as it was to toggle between the two modes, it was still annoying to have to toggle between them, and the separation discouraged making very quick design iterations. My refinement is to eliminate those two distinct modes and instead display the toolboxes for ship parts and asteroids on the screen at all times by default. (They can be hidden by clicking the X and re-shown from the Panels menu.) Ordinarily, if you have no part or asteroid selected, then you can select and command ships like normal. If you want to modify a ship, simply select your desired part on the left and add it to your ship. Likewise if you want to have fun with an asteroid, select it from the toolbox on the right. 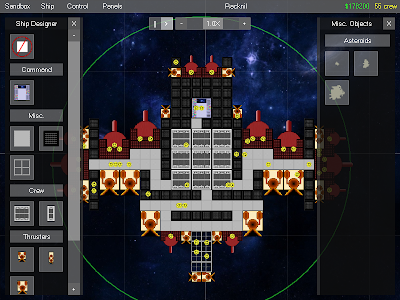 Once you're done either building ships or placing asteroids, simply right-click to get rid of whatever you had selected and you'll be able to command your ships again, just like normal. The elimination of the two distinct modes is definitely less annoying and more intuitive too. The few people who I've had playtest the game seem to agree. My only real lament now is that the presence of both toolboxes on the left and right can crowd the screen. It's not too bad on large monitors, and you can hide either or both of them if you want, so it's not a big deal, but I still wish the user interface was less crowded. I also recently made another important refinement to the sandbox, which is the elimination of "ship grids". Previously, in order to build a new ship, you first had to place an empty "grid" into space, and only then could you put parts and rooms on the grid. In this latest version I streamline the process by allowing you to place a part directly into empty space, without requiring a grid first. To further extend your new ship, simply select a new part and when the mouse cursor is near the ship, the selected part will snap into position.